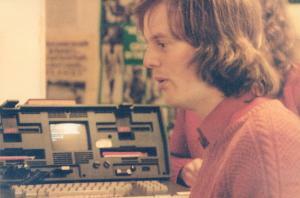 In 1985, a bunch of environmental activist techies worked together to devise tools that would support networking efforts within the green movement. They called the operation "GreenNet". Soon, GreenNet began collaborating and exchanging information with similar networks in other countries, such as PeaceNet and EcoNet. In 1990 the Association for Progressive Communications (APC) was formed by these networks. The APC currently has 45 member networks serving over 50,000 activists, non-profit organisations, charities and NGOs in over 133 countries. The APC is committed to supporting international links with Southern member and partner networks. For many years GreenNet provided an international gateway for small, indigenous networks in African and Asian countries. The gateway supported email exchange between the internet and 52 networks in Africa and Asia – sometimes the link being the only means of electronic communication for NGOs and other organisations in those countries. More than 20 years on, we now have a technology landscape in the UK which provides most people with easy access to electronic communications. But you’ll see from the unfolding story below, that as the tools, skills and access have changed, GreenNet continues to play a role in supporting social justice movements in their use of communication technologies. a letter of recommendation from GreenNet which helped bring other groups online. The main function of GN was as a network for electronic mail. 2 full-time staff: Mitra (the founder of GreenNet) and Geoff Cohen. collaboration with other countries: USA (PeaceNet), Germany (APOC), Canada (AlterNet), developing countries. GreenNet users: e.g. Greenpeace, New Internationalist magazine, Survival International, International Youth Exchange, Amnesty International, Friends of the Earth (FoE). services included all the services of GeoNet (an international network of mailbox hosts): i.e. electronic mail and telex; access to conferencing; bulletin board facilities and access to over 50 databases and consultancy. GreenNet moved in to Underwood Street with FoE and provided many services to non-profits, including what we believe was the first internet-cafe in London where you could pay an hourly fee to access online resources. A grant from The Joseph Rowntree Charitable Trust (JRCT) was given to GreenNet specifically to expand our reach to the Peace movement, in recognition that supporting GreenNet was the best way to support their other grantees. The first transatlantic computer link up for information exchange outside of the military takes place between IGC (then known as PeaceNet/Econet) in the US and GreenNet in the UK. Winter 1987: The United Nations University for Peace Global Computer Network (UPGCN) was inaugurated in a special two hour television programme shown nationwide across the US on Christmas Day, featuring representatives from Greenpeace, Amnesty International, Survival International, GN and PeaceNet, Peter Gabriel and Steve van Zandt held a concert to raise money for a worldwide network for peace and decided to work with GN. Other musicians included: Howard Jones, Lou Reed and Jackson Brown. The launch of the Musicians for Peace UPGCN benefit concert video, “Hurricane Irene”, released on Virgin Video and screened in England on ITV, was dedicated to GreenNet. Discussions began around the idea of an international network and the name Association for Progressive Communications or APC was thought up. GNFido gateway established at GN providing the first means of exchanging email between email hosts in Africa and the rest of the world. By 1994, GNFido provided Internet gateway services to over 50 small email hosts in Africa, Asia and Central and Eastern Europe. Earth Summit (UNCED) in Rio de Janeiro: providing communications services during the conference – GN was involved as a member of the APC. GN/Antenna, encouraged by Jagdish Parikh, established the “Asialink” project to provide start-up funding and technical support to small hosts in Asia working with social movements in their countries. In June a team of staff and volunteers from the APC (including from GN) attended the United Nations World Conference on Human Rights in Vienna working to enable participants and non-participants alike to access current documents and reports coming out of the conference. GN attended the Fourth UN World Conference on Women in Beijing and formed part of a multilingual, multicultural team of 40 women from all regions of the world who staffed and maintained the communications centres of the conference. From the Ethical Consumer magazine Dec 00/Jan 01 issue: EC selected the 10 largest UK ISPs and 2 alternative ISPs (GreenNet and Poptel) to highlight ISP performance looking at: environmental reporting, pollution, nuclear power, animal testing, factory farming, other animal rights, oppressive regimes, workers’ rights, irresponsible marketing, armaments, genetic engineering, boycott call. GreenNet undertakes a full system migration to the Linux-based co-located platform as part of its commitment to working with open-source technology and plans for increased stability, performance, security, and cost effectiveness. GreenNet sets up the Use-IT training centre and begins running weekly training sessions for local women in basic internet skills at the office in White Lion Street, Islington. GreenNet successfully wins the tender process to rebuild the extensive website of the Electronic Immigration Network and starts out on a new pathway of content management expertise which comes to dominate our work and service provision. GreenNet is invited by the APC to lead a GTZ-funded training workshop in Johannesburg for African service providers, in ActionApps web site development and service provision. GreenNet wins another big tender process, this time to build a web site for the European Social Forum. Requirements for the site include being able to handle content in 5 languages, operate an online registration system for a predicted 40,000 registrations, and a completion schedule of just 5 weeks – again raising GN’s profile as a significant authority on web development in the UK’s voluntary sector. GN begins experimenting with Drupal technologies for web development, taking the emphasis off our reliance on ActionApps for content management projects. GreenNet hosts an APC meeting of 15 members from around the world for a week long workshop on ICT policy monitoring and advocacy. GN’s sister network in Spain, Pangea, decides to colocate its servers with GN. Visiting Pangea techies begin collaborating with GN on providing Linux desktop training and support to end users. Regular monthly training sessions are held in the Old Street office training space for users wanting to migrate to Linux. GreenNet provides technical support to its sister network in Mexico, Laneta, for developing and diversifying their web services using Drupal technologies. GreenNet plays a major role in the UK’s first Take Back the Tech campaign during November’s 16 days of action against violence against women – developing and hosting the campaign website. GreenNet celebrates its 25th anniversary working for environmental and peace groups, continuing to provide access to a range of communication and internet technologies. GreenNet’s services go offline for 5 days following a massive distributed denial of service attack targeted at anti-corruption journalist Andrew Jennings’ Transparency in Sport website, and our data centre’s refusal to allow access for us to restore services. A skeleton email service is set up after 2 days and all servers are back online in 3 days, but the data centre continues to block access to some sections of the network for another 2 days. GreenNet’s users are overwhelming in their messages of support and encouragement despite the loss of service, and after some weeks of superb legal advice all services are removed from the data centre and transferred to a new co-location centre which has 100% renewable energy, as well as greatly improved security, service quality and friendly support. A legal claim against GCHQ’s mass surveillance attacks on ISPs is made by Privacy International in the Investigatory Powers Tribunal. 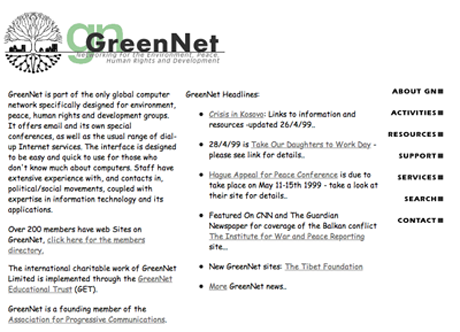 GreenNet is part of the claim in the UK, along with Riseup (US), Greenhost (Netherlands), Mango (Zimbabwe), Jinbonet (Korea), May First/People Link (US), and the Chaos Computer Club (Germany). “Congratulations to Association for Progressive Communications (APC), on their Electronic Frontier Foundation (EFF) 2015 Pioneer Award. Executive Director Anriette Esterhuysen and the APC have been honored with this well-deserved award tonight for their decades-long work leveraging the Internet to support the causes of peace and justice, the environment, open source and access, and human and Internet rights, around the world. GreenNet and Privacy International are nominated for Heroes of the year by ISPA, the UK Internet Service Providers Assocation for "legal challenges that revealed some of the extent of GCHQ surveillance and led to changes in the law."